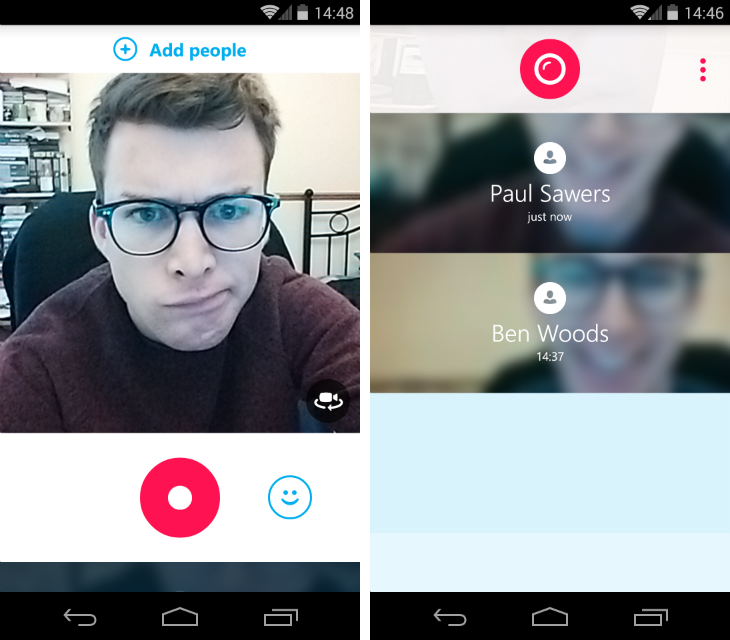 Skype is introducing a new video messaging app for Android, iOS and Windows Phone called Skype Qik. As its name implies, the app is centered around sharing short, spontaneous clips. To record, you pull down from the top of the screen and press the giant, pink button underneath. As The Verge reports, these clips can be up to 42 seconds in length and sent to anyone in your address book. If they have the Skype Qik app on their smartphone, they’ll receive a notification; if they don’t, you have the option to send them an SMS with a relevant download link. All of the videos are in a square-crop format, just like Instagram and Vine. Conversations are maintained on the home screen and you can select each of them individually to see what’s been sent in the past. Prior videos are lined up as circular orbs at the bottom of the screen, with a video player just above. The app also offers “Qik Fliks” for when recording a full-blown video just feels like too much hassle. Skype describes these as “GIFs you record yourself,” which equates to five-second clips that can be stored and sent with a single tap. Like GIFs, stickers and memes, the idea is that you’ll store these and send them as quick, probably hilarious video responses to your friends. Qik Fliks are available for Android and iPhone users; Skype says the feature will be introduced in the Windows Phone app in the coming months. Skype has taken great strides to make its original video messaging service appealing on mobile. It’s never quite taken off though, at least not like other messaging apps that offer video as a peripheral feature. Skype Qik is the company’s attempt to build a new, mobile-first experience from the ground up. It’s still focused on video, but could be the lighter, simpler experience that finally resonates with smartphone users. The competition is tough, however.